CAPT. JOHN J. SIMMONS, who resides on section 18, of Tower Hill Township, Shelby County, was born in Troy, N. Y., May 7, 1814. When he was very young his father removed to Covington, Ky., and lived there about two years. From there he removed to Switzerland County, Ind., where he remained for seven years, then he removed again to Cincinnati, and with his family occupied the first house in Cincinnati, Ohio, which was built of logs. From the time our subject was a lad of fourteen years of age until his parents' death, he made himself their protector and provider, supplying them with all the comforts of life that it was possible for him to give them. After he was fourteen years of age he was employed in steam boating on various rivers and was thus engaged for fifty years. In August, 1874, the gentleman whose philanthropic life it is our pleasure here to chronicle, and whose portrait is also presented to his many friends, came to Shelby County and settled in Tower Hill, where he has since been a resident. He is the owner and proprietor of two hundred and seventy acres of land, upon which he has erected a very good series of buildings. His residence, to which he has given the very suggestive name "Happy Home'" is located at only a short distance from the meeting of two roads and as the traveler approaches he sees the name of the place in large letters on the house; of course it attracts much attention. It is, in fact and deed, a happy home. Capt. and Mrs. Simmons, at the present writing, (May, 1891) have been married about fifty-seven years, and during all this time not an unpleasant word has passed between them. Everything within and without denotes happiness and comfort. Capt. 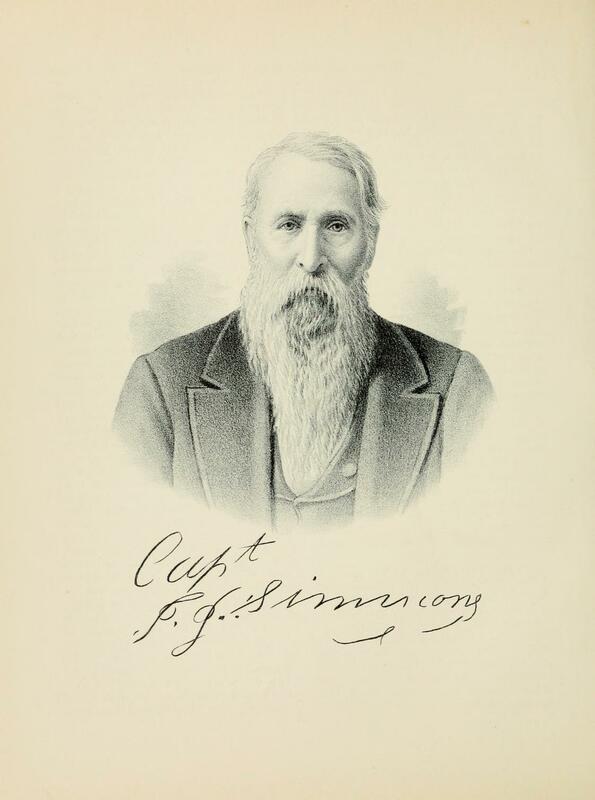 Simmons, who is at an advanced age, is at the present time in feeble health, and is the object of the solicitude and kindest attention of each and every member of his family. His marriage took place in Cincinnati, Ohio, October 8, 1835, and the ceremony was solemnized by the father of Benjamin Harrison, present President of the United States. Mrs. Simmons was Miss Elizabeth Gunning, and was born near Cincinnati, January 11, 1817. Ten children were born to this worthy couple and instead of being cares and sources of trial to their parents, as is unhappily too frequently the case, they have been welcome, and grown up both loving and beloved among themselves and bearing a tender regard for the authors of their being. In name they are as follows: Alonzo, Caroline, Albert, John J., Temperance J., Moses E. and Charles. The deceased children died in infancy. Alonzo was married to Mary Newbold. Caroline was the wife of Monroe Taylor. Albert was united to Lucindia Frailkill. John J. married Anna Custer. Temperance J. is the wife of Marshall Hipes. Moses E. married Elizabeth Elliott. Charles was united to Ella Fluckey. Capt. Simmons has ever been a supporter of the Gospel and he and his wife are members of the Christian Church. Socially he has been united with the Masonic fraternity, for many years, and is also an Odd Fellow. His Masonic connection extend over fifty years, and his alliance with the Odd Fellows for the same length of time. It is a commentary upon the effect of the use of stimulants that Capt. Simmons, who has attained an age a good many years transcending that which is usually allotted to man, has never used tobacco in any form, and although, having been a river captain for many years and associated with men who have the reputation for indulging in stimulants to an alarming extent, he scarcely knows the taste of intoxicants. Capt. Simmons is the proud possessor of a fine orchard covering thirty acres. For this he was offered $100 an acre, by D. James, who is a prominent nurseryman in Christian County. The fruits that are the outcome of this orchard are as luscious as any that come from the Golden State. The father of our subject was John W. Simmons, who was a native of New York City. He died in 1859 while on a visit to Wisconsin. Our subject's mother was Dolly (Ginison) Simmons, who was born in Boston, Mass., and died in Kokomo, Ind. The parents of Mrs. Simmons were Robert and Temperance (Cox) Gunning. They were born in Knoxville, Tenn., and died in Indiana. The position of chief engineer as well as that of Captain was held by Mr. Simmons who is the possessor of fifty sets of Government licenses. He served through the war, taking part in the marine conflicts on different gunboats, sometimes changing from as many as five different boats in a single day, although he had not enlisted in regular marine service. His daughter, Mrs. Caroline Taylor, at whose instance this sketch is written is the mother of two children, John S. and Frank S.
The venerable old gentleman, whose picture would serve as a happy representation of the beloved follower of the Master, is revered by all. All his fads and fancies are quaint and benevolent and show a generous spirit. He has provided a comfortable room in an outbuilding, which he prepared especially for tramps or homeless people, knowing all to be God's people, and believing it to be incumbent on all who are prospered, to care for the helpless, the homeless, and the unfortunate. He is a dear old gentleman, and makes one better and gentler to come in contact with him. Extracted 11 Jan 2018 by Norma Hass from 1891 Portrait and Biographical Record of Shelby and Moultrie Counties Illinois, pages 366-368.